Join us for the next PTA meeting this Thursday, February 7th at 6:00 in the CPA library. We hope to see you there! 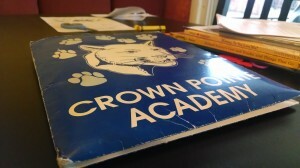 The CPA Yearbook is now for sale! Check out this week’s Update (attached) for information on how to order your yearbook online. A standard yearbook is $16.50, and there are options for customization as well. The deadline to purchase your book for May delivery is April 23rd. Progress reports will be sent home with all students next Monday, February 11th. If you have any questions about grades or assignments, please contact the teachers directly. This is also a great time to clear up any outstanding fines or fees with the front office. Contact Sandi MacGregor if you have any questions. As a school, we have recorded 7,500 volunteer hours for the year. Please remember to record all of your volunteer hours and help us reach our volunteering goal of 14,000 hours for the year. Demonstrating strong parental involvement can help CPA qualify for grants and other funding opportunities, so it’s important that every hour is recorded. You can fill out the paper log and return it to the office, or you can record your hours online by sending an email to volunteer@crownpointeacademy.org. Make sure to include your name, your student’s name, and the total hours volunteered for the month in the email. Thank you!